How’s your 2014 so far? Have you been keeping to your new year resolution and have you been eating well? The past week have been a gastronomic journey for me attending Chinese New Year reviews, followed by a much needed break in Rasa Sayang Resort, Penang. Needless to say, I came back and promptly stocked up my fridge with vegetables, literally overfilling it. My body will thank me for it. I shall share a healthy recipe with you too. Hash, derived from the French verb Hacher, means “to chop”. It’s a dish consisting of diced ingredients and spices. The most popular kind of hash would probably be Corned Beef Hash, commonly served as breakfast food with eggs. In the past couple of years or so, Hash dishes are making a come back and we now see many versions using different ingredients. Potatoes are the most common, followed by sweet potato, the healthier cousin. Though today, I’m sharing a super low carb recipe using Cauliflower to substitute the tubers. Yes, this is Paleo-friendly, Gluten free, and Dairy Free. But most importantly, it’s super delicious with aromatic spices. Plus who can resist the golden egg yolk trickling down the ‘hill’? I know I can’t. 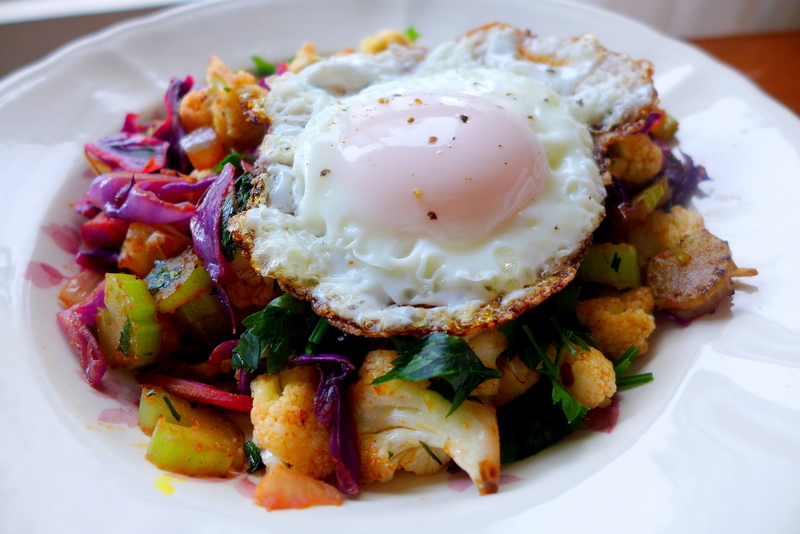 So here it is, my Paleo Vegetable Hash with Fried Egg. Heat the oil in a large skillet over medium-high heat; add the vegetables and onion in an even layer and let it cook without stirring until it takes on a little color on the bottom, about 2 to 3 minutes. Give it a stir, then add the garlic, spices, salt, black pepper, and water. Cover the skillet and cook until the vegetables are tender but not mushy, and has taken on a golden color, about 3 to 5 minutes. Squeeze in the lemon juice and cook until evaporated, about 30 seconds. Serve with the parsley sprinkled on top, and add a fried egg cooked to your liking. Poached egg would work fine too, though personally for this dish I prefer a little bit of crispy edges on the egg white. 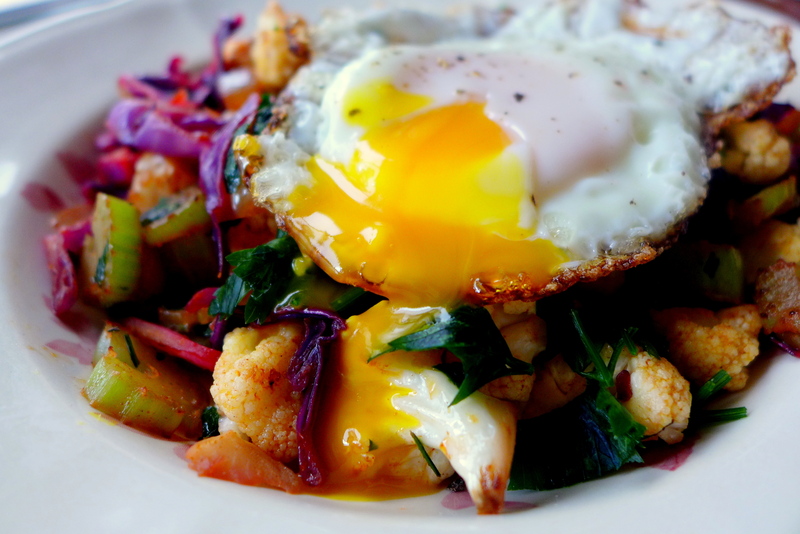 Cauliflower tastes really good with the mixture of spices, and even better with some egg yolk. I love using colourful vegetables not only for the health benefit, but also for the visual appeal. This is something I don’t mind eating everyday. Oh by the way, I have something even better. Click Here for the ultimate visual pleasure. You are welcome. Who’s into Yolkporn like I do? omg.. your egg looks sooo nice. i could picture the yolk running onto the veggies. yum! really nice! 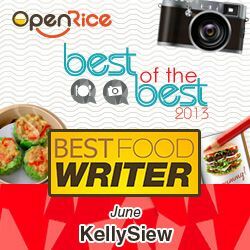 it’s always encouraging to meet food/ cooking enthusiasts! no matter amateur or professional!